This diagram shows the main differences between riding a horse in the way that comes naturally (left) - reacting to the movement rather than channeling it - and the balanced way of sitting that the rider can learn (right) which helps the horse to support us in a strong and balanced way. The pages on HHT are so wide-ranging and interrelated that we strongly recommend you look at the site plan to find other subjects that may interest you. Anything to say about this page? Leave your comment in the box below. AudioRide is a series of exercises designed to listen to while you ride. Audio descriptions guide you through each step of developing a balanced, dynamic connection with the horse through your position. This truly innovative learning tool gives you a whole new way of being guided in your riding, in a calm, clear, step-by-step way. Now available exclusively from HHT! A unique, comprehensive guide to practical rider biomechanics. 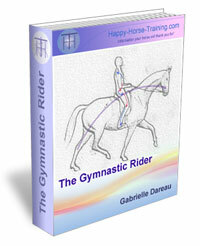 This professionally produced eBook takes the rider through the process of developing their body in the specific way that brings the horse's movement into harmony and balance, without force and constraint. Click here for full details, and to download the 15-page introduction to the book for free. Join the Happy Horse Training group on Facebook! See and share topical info, news and photo's, and take part in lively discussions. Click here to go to the HHT group (make sure you log into fb first) and then click on the 'join' button at the top of the page. Join the Whole Horse Newsletter! HHT's free monthly newsletter giving you wide-ranging and intelligent insights into holistic horsemanship. Just enter your details below to join. I promise to use it only to send you the whole horse newsletter. Free bonus on the riding position with all new subscriptions: Ten Top Tips To Instantly Improve Your Connection With Your Horse. 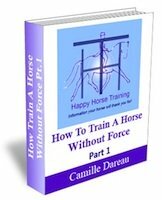 How To Train A Horse Without Force is a unique guide to training horses through energetic connection and gymnastic training. Part 1 covers everything on the ground, from handling to the lungeing technique that develops strength, straightness and engagement. Comes with a free eBook supplement on Horse Trauma. "As a student of Zen Buddhism for nearly three decades, I've often wondered when someone was going to write the book on Zen and the art of horsemanship, and I think that your emphasis on mindfulness and energy connection gets right at the heart of the matter." - Prof. Teresa Lloyd, U.S. So many people have been through wonderful experiences with horses, whether in training or otherwise. If you've made a change in a horse's life - or one has made a change in yours - tell us about it here. 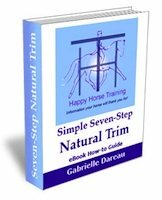 The Simple Seven-Step Natural Trim is a comprehensive step-by-step guide to a cutting-edge barefoot trim. Click here to find out more. "The riding instruction is outstanding, if instructors in the UK taught this way there would be a lot of happy riders and horses." "The riding tuition exceeded my hopes and expectations by a long way; giving me an exciting new facet to horsemanship which is lighter. more subtle, more elegant and more meaningful. It is as if a new door has opened bringing more sunlight and air." "My goodness - what a change has taken place in my riding. I think that I'm starting to sit 'into' the horse rather than on top of him. I felt my horse's movements in a way that has almost never happened before"